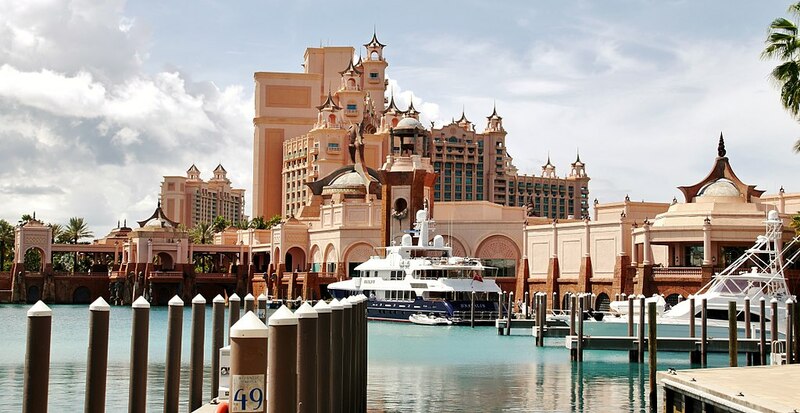 Experience the refined elegance and beauty of the Marina at Atlantis. This grand harbor is designed to rival the rich and famous Marina of Monte Carlo. This enormous facility can accomodate vessels as large as 220 feet. Those arriving by sea can also enjoy all the features and services of Atlantis. The Marina at Atlantis also offers dock and tie-up assistance, sanitary sewer pump-out facility at each slip, 24-hour staffed security, daily newspaper delivery, complimentary cable hook-up, telephone service at every slip, 24-hour room service to vessels, laundry and dry cleaning services, daily trash pick-up and crew lounge with TV and vending machines. Directions - Set your GPS device to N25.075, W77.32. Prior to entering, you should call Nassau Harbour Control on VHF (Ch 16) and request permission to enter the harbor. Nassau Harbour Control is open 24 hours daily. Entering Nassau Harbour, you should see the Royal Towers at Atlantis. After the side-by-side arched Paradise Island bridges, there is a clearly marked enterance to the Marina at Atlantis on your port side. Please contact the Dockmaster's office on VHF (Ch 10) for permission to enter the Marina. 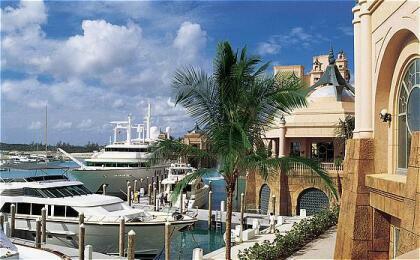 Specifications - The Marina at Atlantis has direct access to Nassau Harbour. The Marina features 63 mega-yacht slips. Both the channel and Marina feature a minimum water depth of 12ft at low tide. The largest of the 63 slips are 160 foot peirs with 35 foot beams. They also feature several lay-along-side berths with no beam restrictions. Note - Slip reservations that touch the nights of 12/25-12/31 must stay a minimum of these seven nights, non refundable. Easter, Memorial Weekend, 4th of July and Thanksgiving, minimum of four nights, non refundable. A 20% premimum fee will be added to the current rates for all holidays mentioned above. Check-in is at 12:00pm and check-out is 11:00am. The Marina office is open from 7:00am-9:00pm daily, call 1-800-ATLANTIS for slip reservations.